On Friday, the 13th of October, in the year 1307 the king's men came knocking. French men-at-arms took the Knights Templar of Paris into custody. It was the start of the end for the "warrior monks" and it also was the event that launched a thousand books and conspiracy theories. Soon after the events in Paris, the Templars in Ireland were also arrested under suspicion of heresy. 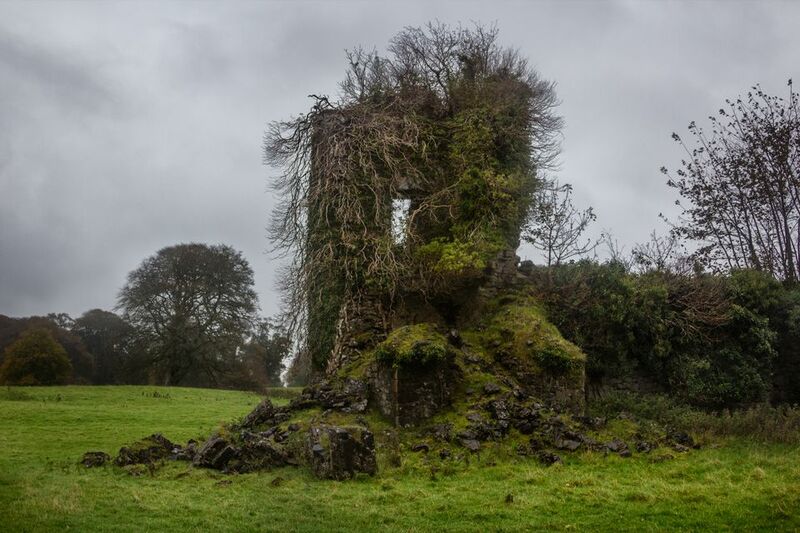 Their empire crumbled - but are there still traces to be found on Irish soil? A few... if you know where to look! The Knights Templar were one of several "knightly orders" founded during the crusades. Forming a new caste of "warrior monks" they took oaths to protect the "Holy Land" and especially pilgrims by the sword. At the same time members strived to lead an exemplary Christian life, mainly based on the medieval orders of monks. Amongst the knightly orders were the Hospitallers (also known as Knights of St. John or Knights of Malta), the Teutonic Order and the Order of St. Lazarus. The "Poor Fellow-Soldiers of Jesus Christ and the Temple of Solomon" were formed in 1118 in Jerusalem, adopted the Cistercian rule in later years and were officially recognized by Pope Innocent II in 1130. From humble beginnings, the Templars (as they became commonly known) established an almost world-wide empire, consisting of strongholds and estates all over Europe and the "Holy Land". Known as ferocious warriors, they were also operating as bankers and moneylenders. This last activity more than likely caused their downfall - the heavily indebted Phillip IV of France accused the Knights Templar of heresy in 1307, had the leaders thrown into jail and orchestrated a show trial. With the complicity of the pope, the Templars were incriminated, tortured, suppressed (in 1312) and their leaders burnt at the stake (1313). Most knights were either "pensioned off" or taken into other orders as were most estates, especially the Hospitallers profiting hereof. Ireland was not a crusading country - even the most obstinate locals were devout, non-heretic Christians. So there should not have been any reason for crusaders to be here, should there? But one should remember that the knightly orders were interrelated with feudal society to a large extent - knights went into temporary service to atone for sins, some even joined to relieve the burden to their families' estates. Others took the full vows late in life, using the orders as a sort of retirement home after a worldly career. And kings and emperor tried to stay in the good books of the orders (which after all provided an ad-hoc task force in times of trouble). Giving estates to the orders and thus "planting" a few combat-hardened veterans as an unofficial police force into wilder areas of the realm was par for the course. This seems to have been what happened in Ireland - the Knights Templar were given estates, most of which were populated with elderly knights. Still, a valid fighting force, though maybe not up to scratch in Palestine and Syria. Outsiders that kept a watchful eye on the natives, in their own interest. Officially the Templars arrived in Ireland in September 1220, though documents pertaining to individual Knights Templar in Ireland go back as far as 1177. The first knights may well have entered Ireland with Strongbow's Anglo-Normans. It is debatable whether this constitutes an involvement of the order or (more likely) of individual knights. What Happened to the Irish Knights Templar After 1307? After the events in Paris, the Knights Templar in Ireland were arrested and placed in Dublin Castle. Between fifteen and thirty knights were taken, most having seen more than forty years of service with the order. Basically, Ireland seems to have been the pensioner's home of the order. Trials commenced in 1310 in Saint Patrick's Cathedral - accusations based on hear-say flew at the knights, but no evidence could be found and no confessions were forthcoming. The trials ultimately fizzled out, ending after six months in an anti-climax. The Templars were admonished to be good Christians and pensioned off. More than likely none of them were expected to put up much resistance if left alone. The property of the Knights Templar in Ireland was either taken by the crown or transferred to the Hospitallers. Causing no end of confusion for later antiquarians... and for anyone traveling in Ireland and trying to find Templar property today. Today you will find references to former Templar property even if the property had not been in existence before the order's suppression. A "Templar" church at Ballintemple (County Cork) for instance was only built in 1392. Much confusion might have been caused by the Gaelic teampall - literally "temple", but referring to any church. Seriously confusing amateur historians who like to attribute any place-name with a temple reference to the Templars. The best documented Templar link still visible today can be found in Templetown (County Wexford) - in the churchyard grave slabs mark the burial sites of "Poor Fellow-Soldiers". Here, near ​Hook Head, the Templars had lands and houses. Strand (County Limerick) - Temple Strand has a church of almost certain Templar origin. Templehouse Lake (County Sligo, near Ballymote) - Ruins of a house belonging to the Templars (which gave the name to the lake). The actual fun part of looking for Templar relics in Ireland are the "red herrings"... which are being taken quite seriously by some folk. Especially in Dublin. Kilmainham, for instance, is often touted as a "Templar" foundation, variously referring to the Dublin village, its church or even the Kilmainham Hospital. None of these have any connections to the order - but the Hospitallers were active here. Temple Bar sometimes is referred to as connected to the knights by virtue of its name which actually refers to a land-owning family Temple. One of the mummies in the vaults of St. Michan's is commonly called "the crusader", sometimes imagined as a Knight Templar - the deceased lived centuries after the dissolution of the order. And in some circles, a serious scholarship is totally thrown out of the window and myths are wholeheartedly embraced. The website of the Galway-based Circle of Prayer refers to Irish Freemasonry thus: "Their allegiance would be towards the Scottish Rite which has its roots in the Knights Templar, that most evil of organizations."